How Cabernet Sauvignon Is Best Served? How to serve Cabernet Sauvignon? To answer “How Cabernet Sauvignon Is Best Served?” we would to start with the environment. Room temperature is the best temperature for wines to be served. But there is a contemplation whether that is true or if wines should be chilled before they are served. But in this article, you will be clear of this speculation. You will be exposed to the best temperature red wines should be served, especially Cabernet Sauvignon. The way wine is served (the temperature of the wine) has a significant effect on the taste as well as the aroma of the wine. Sometimes, the effect can be so severe that a particular wine served at different temperature can end up tasting differently. This is why it is crucial that every wine is served at the right temperature. Low tannin red wines should be stored and served at 45 – 50 F.
Why Consume Chilled Red Wine? The temperature at which you consume your red wine is dependent on your personal preference. According to study, people tend to consume red wines too warm. 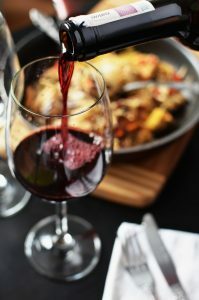 There is a little issue with serving red wines that are too warm; there will be too much emphasis on the alcohol flavor. The only exception is when you are consuming non-alcoholic wines. When a non-alcoholic wine is served too warm, it will be monotonous and flat. On the other hand, when red wine is served too cold, the flavor and the aroma are restricted. They are restricted to the point that the tannins in the wine become too obvious. This will make the wine become astringent. So when serving Cabernet Sauvignon or other red wines, it is crucial that you serve it at the right temperature. Serving it at the wrong temperature might just be a waste of money as you won’t enjoy the wine. In the ancient times, people believe room temperature is the best temperature to serve red wines. But this is not entirely true as room temperature varies from person to person and from place to place. Also, the temperature at which wine is served is also dependent on the kind of wine. High tannin wines should be served at a temperature lower than medium and low tannin wines. Specifically, high tannin wines such as Cabernet Sauvignon should be served at 62 to 68 F. This is because tannins become more emphasized as the wine gets colder. Hence, full-bodied red wines should be served at warmer temperature. This will make them to maintain their flavors as well as aromas. It will also make it less astringent.